-Iron compounds are the most common coloring agent in ceramics. On one hand, they are nuisance impurities where they stain an otherwise white clay or glaze or where they muddy an otherwise bright color. At the same time, iron exhibits so many personalities with different kiln atmospheres, temperatures, and firing cycles and with different glaze chemistries that it is among the most exciting of all materials. -Chemically, iron is amphoteric like alumina. 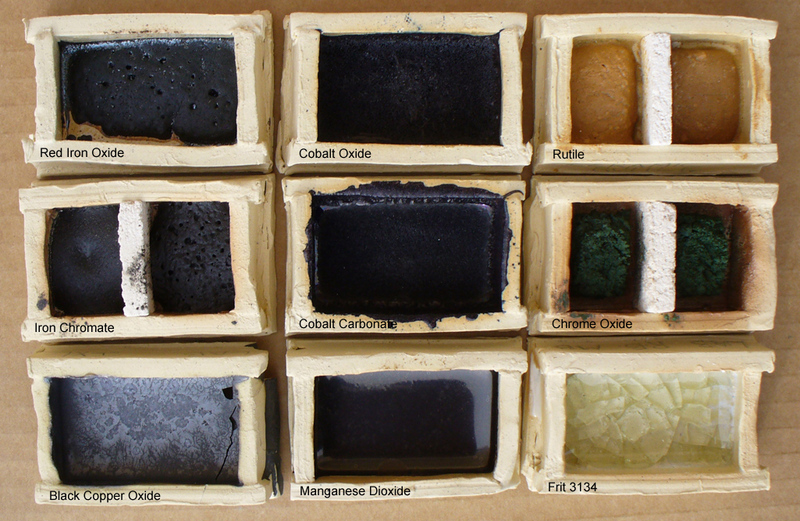 Fe2O3 generally behaves as a refractory antiflux material in a glaze melt, combining with alkalis. Oxidation iron-red glazes, for example, can have very low alumina contents yet do not run off ware because the iron acts like alumina to stabilize and stiffen the melt. However these glazes likely will have somewhat reduced durability. -In glazes low in flux it can behave as an alkali, combining with silica. -Fe2O3 is very affected by a reducing atmosphere where it can act as a flux in both bodies and glazes at high temperatures. Its fluxing action in reduction is quite remarkable and can be demonstrated using a line blend in a clear glaze. Higher amounts of iron exhibit dramatically increased fluidity (see FeO for more info). -Fe2O3 is the most natural state of iron oxide where it is combined with the maximum amount of oxygen. In oxidation firing it remains in this form to typically produce amber to yellow up to 4% in glazes (especially with lead and calcia), tans around 6% and browns in greater amounts. In the 20% range, matteness is typical. However, once it reduces to FeO and immediately begins fluxing and forming a glass, it is difficult to reoxidize. Since the breakdown of carbon or sulfur compounds in body and glaze so easily reduces iron, a slow and very thoroughly oxidizing atmosphere is critical through the 700-900C range to assure that all the iron remains in its antiflux oxidized form. -Most glazes will dissolve more iron in the melt than they can incorporate in the cooled glass. Thus extra iron precipitates out during cooling to form crystals. This behavior is true both in oxidation and reduction. For example, a typical mid-temperature fluid oxidation glaze of 8-10% iron will freeze black with fine yellow crystals. Lower temperature glaze with their high flux content can dissolve more iron (i.e. aventurine). -Zinc can produce unpleasant colors with iron. -Titanium and rutile modify iron and can give some striking variegated effects. 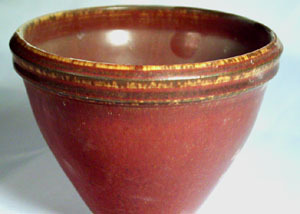 For example, a popular middle temperature pottery glaze employs 4% tin, iron, and rutile in a clear base to give a highly variegated gloss brown. Another popular cone 6 glaze uses 85% Albany slip, 11% lithium, and 4% tin to produce an attractive gloss brown with striations and flow lines similar to classic lead glaze effects. -While many iron-stained clays are reddish in color, high iron clays can also be blackish, grey, brown and deep brown, pinkish, greenish and yellowish or maroon. Some can be quite light in color yet fire to a brown or red color. 6-7% iron is considered a high-iron clay, but some stained clay-like materials can have 20% or more iron. A typical ivory colored oxidation firing body has 1-2% iron oxide. -Low temperature earthenwares can exhibit a wide range of iron red colors, depending on the firing temperature. Typically, low fired materials burn to a light orange. As temperature is increased this darkens to light red, then dark red, and finally to brown. The transition from red to brown is often very sudden, occurring across a narrow temperature range. Thus the working temperature should be sufficiently above or below this range to avoid radical color changes associated with kiln variations. -Fe3O4 is an intermediate form of iron which is brown in color and exhibits intermediate properties. Fe3O4 can either be a mix of FeO and Fe2O3 resulting from an incomplete conversion from one type to the other, or it can be a completely different mineral form of iron known as magnetic iron oxide from the ore magnetite. The latter is a hard crystalline material of use in producing specking in bodies and glazes. -Generally additions of iron oxide to a glaze will reduce crazing (if supplied in adequate amounts; beyond 1 or 2 percent). In low fire the presence of iron produces red terra cotta colors that progress to brown with maturity. High temperature red bodies depend on stopping firing well short of vitrification. In higher temperature vitreous bodies fired in reduction iron is converted to actively melting black iron oxide that teams up with feldspathic melts that can dissolve benificial mullite and quartz crystals. As iron - rich liquids cool into glass, the glass has a brittle character. Low fire lead, potash and soda glazes encourage reddish colors with iron. Should be barium free. In reduction glazes Fe2O3 tends to fire bluish or turquoise to apple green with high soda (boric oxide may enhance). 0.5% iron with K2O may give delicate blue to blue green. Iron produces a wide range of browns in bodies and glazes at all temperatures. Fe2O3 tends to fire yellowish with calcia and in alkaline glazes straw yellow to yellow brown. In reduction, 3-4% iron with 0.4 BaO, 0.15 KNaO, 0.25 CaO, 0.2 MgO, 0.3 Al2O3, 1.7 SiO2 and 15-20% zircon opacifier will produce a yellow opaque. The recipe contains 6% red iron oxide. The chemistry is high alumina (from 45 feldspar and 20 kaolin), zero silica silica (4:1 Al2O3:SiO2 ratio) and 20% calcium carbonate. The remainder is a little talc and calcium phosphate. The reduced iron is fluxing what would otherwise be a very matte surface. Reducing the iron percentage to 4% produces a yellow mustard color. 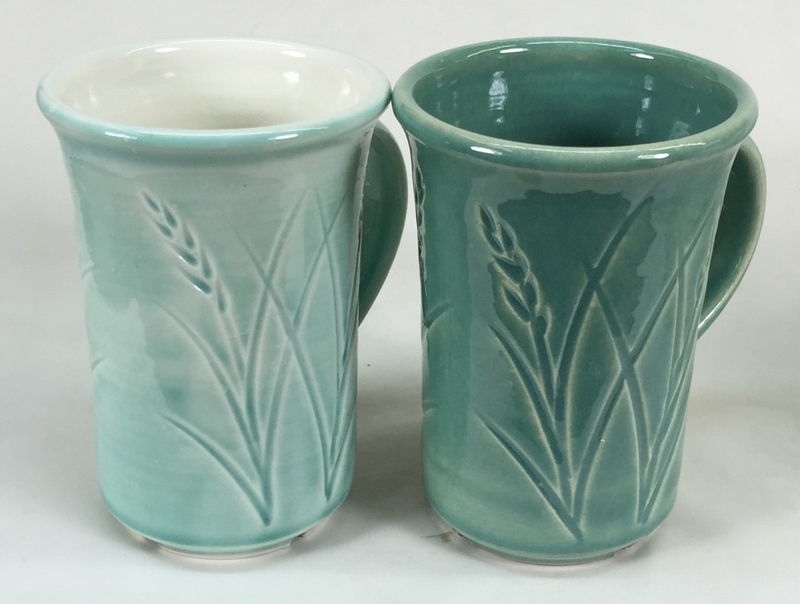 Why is this glaze so different on these two different porcelains? Why the difference? The one on the right (Plainsman M370) is made from commodity American kaolins, ball clays, feldspars and bentonite. It looks pretty white-firing until you put it beside the Polar Ice on the left (made from NZ kaolin, VeeGum plasticizer and Nepheline Syenite as the flux). These are extremely low iron content materials. 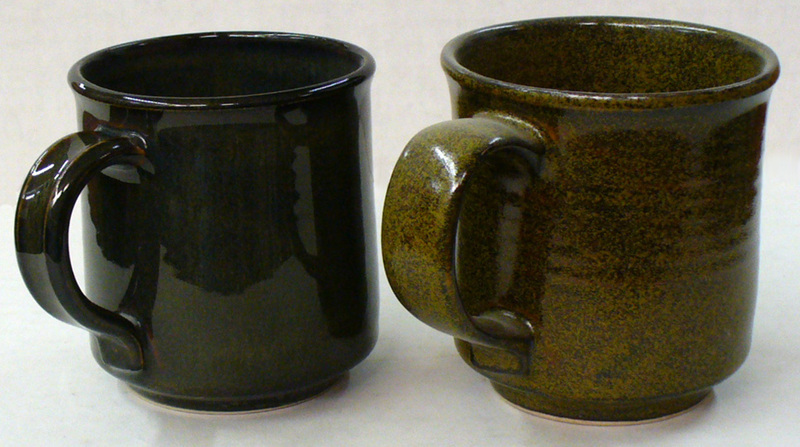 M370 contains low iron compared to a stoneware (less than 0.5%) that iron interacts with this glaze to really bring out the color (although it is a little thicker application that comes nowhere near explaining this huge difference). Many glazes do not look good on super-white porcelains for this reason.